Big Rigs 'n Lil' Cookies: Chicken Update! 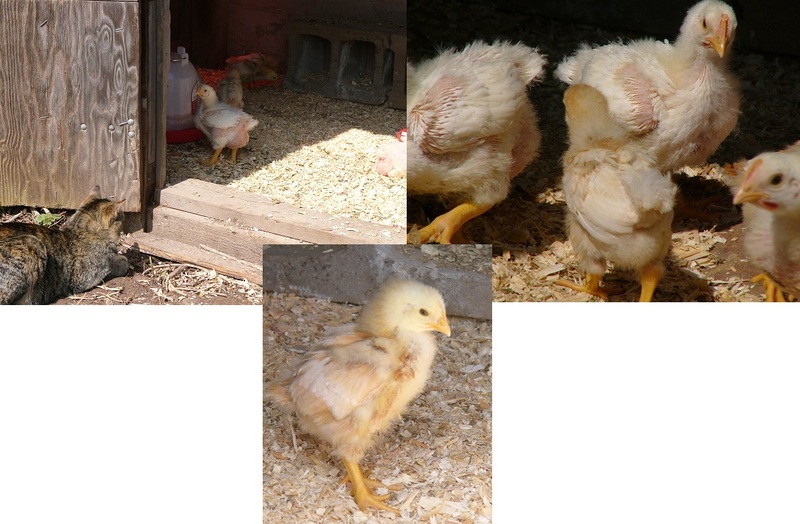 The lil' baby chickens are growing! Oh my, they are growing so fast! I haven't been around chickens since I was less than ten years old, so a lot of fuzzy memories, and things that amaze me now! I will admit, I learned of another insane personality trait I possess. Apparently I have a need to sing to my chickens. 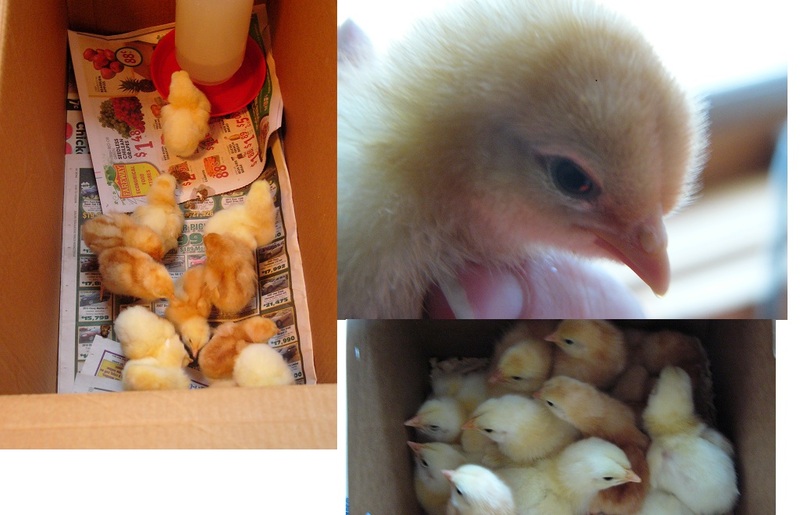 You should feel very bad for these poor lil' chicks, cuz me singing.... is NOT a good thing. I sing in the shower when no one else is on the property, and I sing when alone in the car. That's it, until now. Poor chicks. The other sad part is, for some completely bizarre reason, I feel the need to sing "Rockin' Robin" to them. With this obsession, I have learned that I do NOT know the lyrics to this song. I can muddle my way through the chorus, and that's it. So, about all these chicks get is "Tweet Tweet... Tweedle...leee...deee." Yes, my chickens are tortured. Anyway, back to the chicks... the Cornish Rocks are HUGE! Their legs are about catching up with the thickness of my pinky finger, stocky birds. Since getting them, I have learned that they do grow VERY fast. 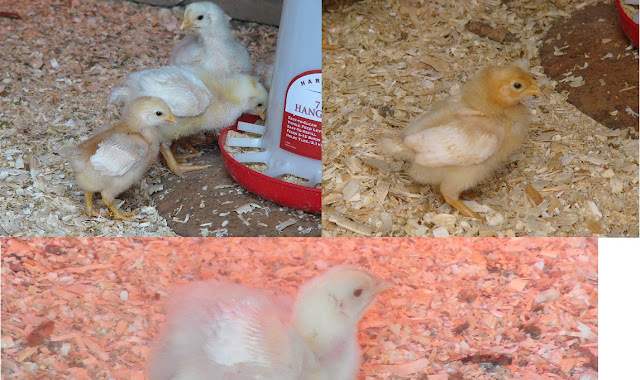 The Red Pullets, are growing, but not nearly as fast. It's hard to catch in photo's, but the pullets are really starting to change colors, and are going to be a pretty bird. Here are a couple pics of old and new... I pulled some old together to help show how much they have grown. Tippy is interested in them, but seems peaceful so far. Rusty just loves them, and races me to the coop. Having chickens is great fun. I was slow to join the bandwagon, that my husband put me on, but now I love the hens. I'm shocked that your dog AND cat are so accomodating. You must have very easy going pets!!! I will be stopping by your blog to read about your hens! I am soo new to all this!